Just Take Our Blood Already! There's a level of cuteness that makes us simply hand over anything we might have that holds value. Like if a shar-pei held us up at the ATM we'd probably hand over the cash and call him a good boy. And if we watched a lemur hop into our car, hotwire the engine and take off into the sunset, we wouldn't call the police. We'd need our phone to capture that adorable phenomenon on camera. So when it comes to an adorable baby vampire, our defenses are down. There's no way we wouldn't allow a Little Vlad into our house when he showed up at the window pane. We wouldn't be able to smear ourselves with garlic or pile on our silver jewelry. That blood-sucking baby would get what he wanted! Your baby will be perfectly on-theme for his first Halloween! Little Vlad will stay perfectly comfortable in super-soft fabric. The cape is attached to the red swirling patterned vest with a hook and eye touch strip. The shiny blouse underneath the vest will make your little one look perfectly at home in a crooked castle in Romania. We wouldn't even be surprised if you slipped the soft trousers on your child outside of Halloween. Are you ready for your little one's first Halloween? It's a great idea to go the traditional route. You'll treasure how timeless your child looks in those posed pictures with spider webs and pumpkins props. The whole family can dress up together. 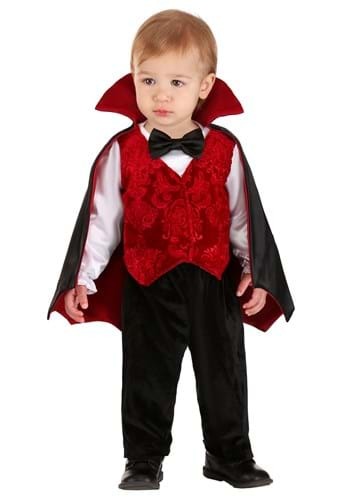 We think mom and dad would look quite chilling in one of the vampire costumes from our vast selection. Just make sure your little one is well fed. After all, we think that Little Vlad is still kind of young to start drinking blood.